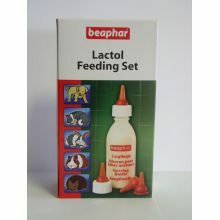 Lactol Feeding Set is a ideal .for feeding puppies and kittens, the bottle can also be used for guinea pigs, hedgehogs and rabbits. The set contains a feeding bottle, four teats and a cleaning brush. The Dogit Elevated Dog Dish provides a more comfortable eating position for small and medium sized dogs. This dish is ideal for dogs with muscle and joint problems. Loving Pets Gobble-stopper Slow Feeder is a fun & simple solution the can help stop dogs putting themselves at serious risk from eating too fast resulting in canine bloat. Outward Hound Teal Slow Feeder Bowl Drop Teal is a natural, healthy and playful solution for dogs that gobble their food too quickly. Outward Hound Slow Feeder Bowl Flower Pink is a natural, healthy and playful solution for dogs that gobble their food too quickly.